Nowadays, women are not limited to owning and wearing heels most of the time when going out. They can wear sneakers or tennis shoes anytime depending on the need, their mood, or their fashion style. You may be one of those people who will choose to use tennis shoes over other types of shoes. But do you know that men’s and women’s tennis shoes are made differently? So if you are a woman, or a man planning to give a pair to your wife, sister, girlfriend, or your mom, it is best to know not just the shoe size but also know the different tennis shoes for women. In this way, the wearer will be comfortable in using it even for hours. Of course, when you are buying stuff you would always want to use it for a long time. This is to avoid spending extra money that you can use in more important things. Here are some tips on how you can take care of your tennis shoes and use them for a long time. Use it. Some people do not use their tennis shoes because they may be expensive and they just want to keep them or take pictures of them. But not using your tennis shoes will only shorten its life. The materials will deteriorate and some shoes may lose their shape. Wear it and use it whenever an activity calls for them. Wear your shoes properly. In some instances especially when you are in a hurry, you may be wearing your tennis shoes without untying the shoelaces. By forcing your foot into shoe only bends its heel counter and stressing the stitches. Take time to untie the shoelaces when wearing and taking your tennis shoes off. Clean your shoes. They also need TLC if you want to keep them longer. Use a mild soap, scrub brush, and cold water when you clean your pair. Let them air dry. It is not advisable to clean your tennis shoes using a washer-dryer as it will just deform your shoes. Store them properly. It is best to keep them in a cool, dry place. Knowing these simple tips will not only keep your tennis shoes longer but will also make them look brand new every time you use it. Asics is one of the brands that you can trust when it comes to tennis shoes. Tennis shoes today are getting reinvented to give comfort to its users. Is this the one for you? This pair looks comfortable based on its design. Any pink lover would want to own this as it screams pink all over. It has a simple design that any wearer will like. This has PGuard Toe Protector. It has Personal Heel Fit (PHF) Collar Lining that acts as a mold to the wearer’s feet. This has Trusstic System Technology. With its PHF, additional comfort is guaranteed as the shoes will be following the size and structure of the wearer’s feet. It is comfortable to wear for hours with its high arch support. This grips on the tennis court well. Size is a bit off. Some say it is half an inch smaller/bigger. Outsole do not last for more than 3 months with everyday use. If you are looking for an extra pair of tennis shoes, this can be a good choice. You must need to break this in from the time you buy it so it can adapt to your feet well. If you are planning to buy this online, try to fit it first in a shoe store so that you can order the right size. 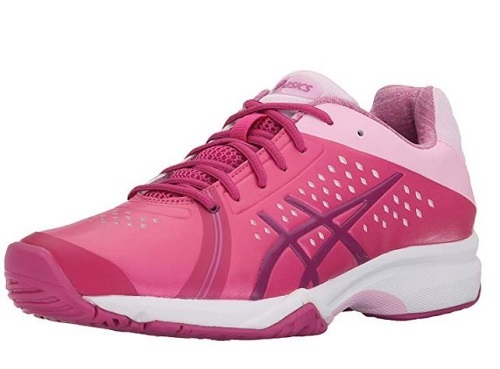 Asics has a lot to offer to women when it comes to tennis shoes. Sometimes having a simple design is great as it can be paired with any outfits. 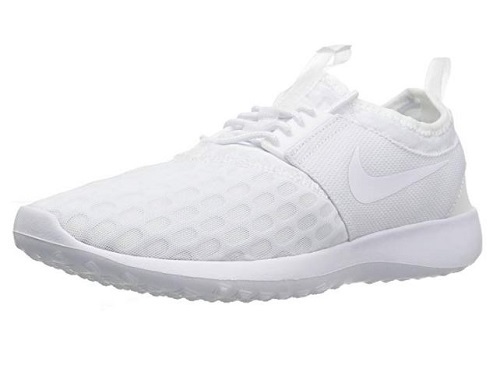 If you are looking for a white tennis shoes, this might be the one for you. 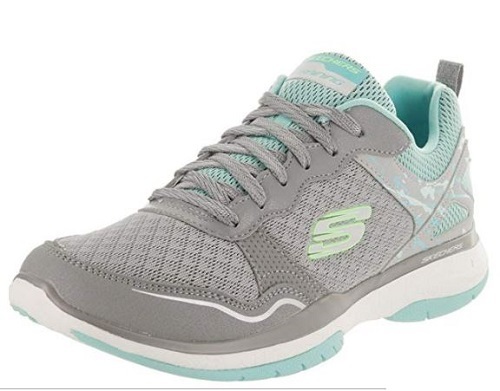 This pair looks like a reliable running shoes for women. It looks comfortable to wear but difficult to clean with its all white design. Could this be the one you need? This has solid rubber outsole. It has Trusstic System Technology to reduce the sole’s weight. This is equipped with forefoot GEL cushioning system. They are a great fit with people who are suffering plantar fasciitis. It gives more ankle support when playing tennis. Size is perfect to people who have slim feet. It can be difficult to clean and keep it white. If you are one of the people who appreciate minimalist designs then this pair is perfect for you. This will look great on any outfits and you will be comfortable wearing it. Just a reminder if you think you have a wide feet, go one size or half size bigger to ensure comfort. A good pair of tennis shoes must not only look cool but is also cozy to its wearer. Finding tennis shoes like that can be a challenge but is worth it in the end. That is why you need to research first the tennis shoes you are planning to buy. Do you like bright and happy colors? Then most likely you would consider having these K Swiss tennis shoes. The yellow details look good in these sky blue kicks. It has a Durable Aosta 7.0 rubber outsole. This is equipped with Dual density Guideglide EVA midsole. 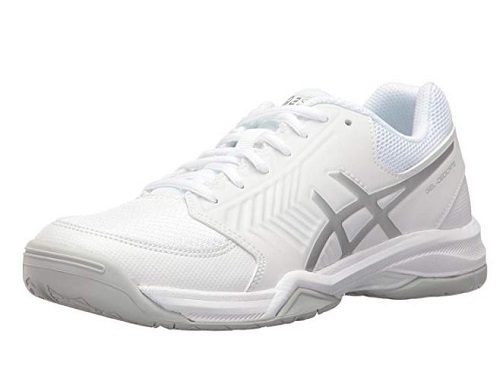 This is great to use in tennis with its wide sole for easy weight shifting. This pair is also light in weight. Some say that the size of this style is kind of big. Soles can easily wear down in 2 months of 3 times a week use. This pair is good to use a couple of times in a week to prolong its lifespan. But you will love wearing these shoes as it is breathable. It has a stylish color design that can be a headturner in any court. One of the top brands used in any sport is Adidas. It is not a shock that there are Adidas tennis shoes for women. If you are an avid fan of the 3 stripes, you may consider copping this one. 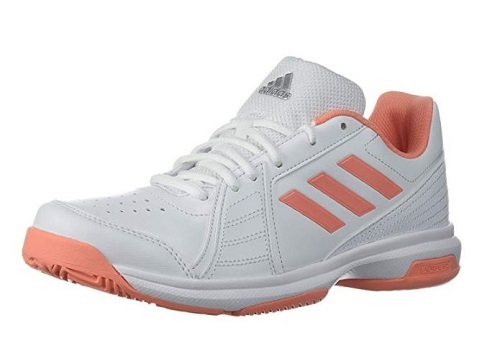 This womens tennis shoes Adidas has a clean design with a powder pink details that many girly girls will love. It looks durable with its intricate stitching. You can easily wipe the dirt off with its material. It is made of synthetic. This has a rubber sole. The shaft is measured low-top from the arch of the foot. This fits great even with people who have wide feet. This pair is perfect for playing tennis. The price is much cheaper compared to other tennis shoes. The sizing is way big. A few experienced having blisters at the back of the ankle due to the shoes’ collars. Adidas has been producing quality shoes and this may be a great addition to someone’s Adidas shoe collection. It has a great design and looks comfortable too. A good tip is to fit it first in your local store before you purchase it. 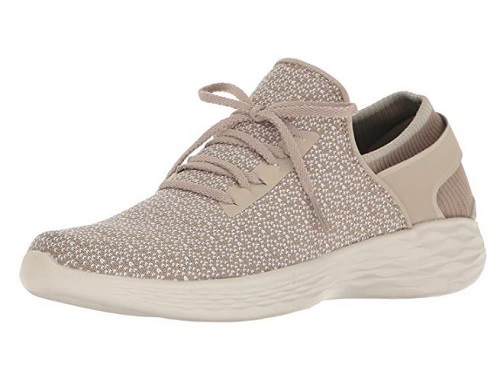 You may have never heard of the Xinbeige brand but it is one of the best tennis shoes this 2019. 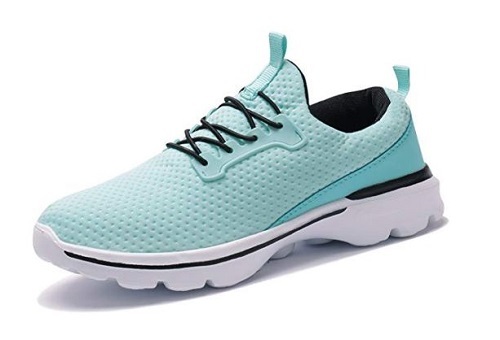 They are producing shoes and making a name in producing comfortable walking sneakers.. Read more to know more about their tennis shoes. At first glance, this Xinbeige tennis shoes look soft and comfortable to wear. It is great for people who are always in a hurry as they do not need to untie the shoelaces to wear them. You just need to shove your feet into the shoes and you are good to go. It is made of breathable mesh material. The shoes have colorful designs. It is lightweight and no need to tie the shoelaces. You can easily wear and remove the shoes off. People who have bought this pair say that the shoes are true to their size. They are non-slip thus good to wear when you are walking or running. Some say that their sizing is small. A few says that the sole is rather big. the shoes may be tight too some especially when they have wide feet. It will be a good choice if you want to try these shoes is to order one size bigger. In that way, it will fit snugly on your feet. But if you have narrow feet stick to your size so the shoes will not fall off when you are wearing these. Of course, there are also Nike tennis shoes for women. Nike is without a doubt included in the top 10 tennis shoes list. Get to know more about this pair. This pair of Nike tennis shoes is designed carefully. It has a good and simple style that most people will love. Even though you will not wear it when playing tennis or if you are going out for a jog, this pair will look good on any of your outfits. This is made of leather and synthetic. It has full length air sole unit cushions for support and comfort. This is a great pair for people who are flat-footed. You cannot barely feel that you are wearing shoes as they are lightweight. The sizing is correct for most. The insoles can be easily tear off when worn most of the day. Some say the shoes do not grip well to the floor. If you are a huge Nike fan then add this to your shoe closet. This gives a good support when running or playing. But this can also be used as a casual sneakers because of its design and the comfort it gives to the wearer. Nike has not disappointed their fans in producing quality and good-looking tennis shoes. Some tennis shoes do not look to be used in playing but rather in completing your outfit. Is this the pair you are looking for? This tennis shoes look clean with its all white design. Any outfit will look great when partnered with these. It might be heartbreaking if this will get stained unintentionally. This has a sockless no-tongue design. The rubber sole has a waffle traction pattern. It has a foam midsole. Some people claim this has the best arch support. The waffle traction pattern avoids slips and skids. It is comfortable to wear for hours. You might find it difficult to maintain it white all the time. If you have the money and the patience of cleaning these kicks then these will be great for you. Not only does it give comfort to its wearer but can also add confidence to its wearer as this pair can receive a lot of attention to other people. Not all people know that Converse were and are used in sports. It is not just for the rugged and stylish but for sporty people as well. Are you going to use this for your next tennis shoes? This does not look like a typical tennis shoes with its design. 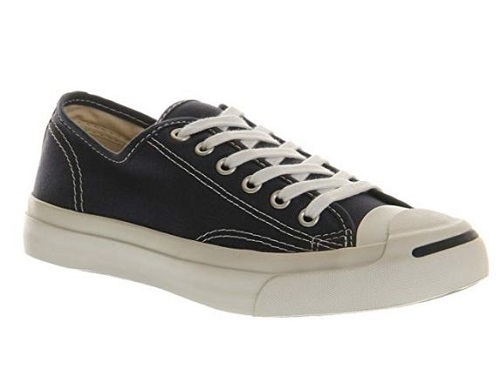 It may be hard to imagine seeing a Converse shoes used in a tennis play but you can these in courts. You may look like a stylish player when you wear these. It is made of canvas. It has a rounded toe area. This can be a perfect pair for flat-footed with its low to no arch design. The rounded toe area lets the feet breathe. Any outfit will look good with this pair. You might get blisters easily as it has minimal cushion support. Some people say that the materials used are thin. 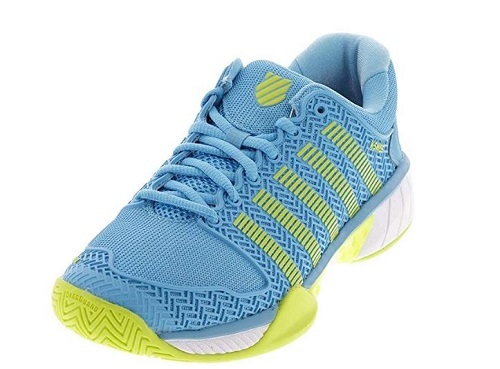 If you are looking for a stylish tennis shoes, then grab this one. This might not be great to be used in playing as it does not have cushion support as its competitors. But if you are only going to use this for walking and a little running, this will be a great pair of shoes. Its design looks stylish and might be liked by many women. It has a simple small pattern that has a modern style. It seems comfortable with the material it is made of. It can be worn without wearing socks. It has a Goga Max insole. You can still wear and use this tennis shoes when all your socks are in the washing machine. The woven mesh adds comfort to its wearer. The size is as expected of the user. The high collar might hurt you when worn throughout the day. Your socks/feet might easily get wet when used on a rainy day with its fabric material. 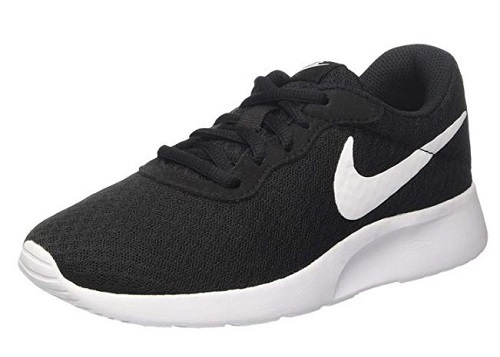 If you are looking for a less expensive tennis shoes that are reliable and comfortable do not hesitate to choose this one. Avoid using it when you know it will be a rainy day ahead as it will only soak down the water. Overall, this is a good tennis shoes that you can consider buying. One of the best tennis shoes in the market this year is this style offered by Skechers. They are known in producing comfortable shoes and this is also one of those. Learn more about this product by reading down below. If you are wanting to add more color in your shoe closet this might be the one you need. Though the overall color is gray, the turquoise touches gives a more stylish look. The insoles are cushioned with air cooled memory foam. It has a full lace adjustability. The padded tongue and collar give extra comfort to the wearer. The sides support the ankles and feet well. The price is affordable even there is no womens tennis shoes sale. The size is half smaller. Some say it is not to be used in long runs and exercise. The amount of money you spend on a product is very important to these days. If you do not want to feel bad when you swipe your card on your next purchase, consider buying these tennis shoes. It will give you the comfort you will need without paying extra bucks. You can purchase tennis shoes online or in a mall near you. That is why it is so tempting to hit the buy button or drive to the mall without knowing the right specifications you must look for especially if there are womens tennis shoes sale. Calm yourself first and read the following to see what you need to know in getting the tennis shoes that will be perfect for you. Size – The most important thing to know in buying shoes is knowing your right shoe size. When you try wearing one it should not be tight in the toe area and should not too loose behind the ankle. Shoe sizes are also different from country to country so it is better to know your shoe size in US or UK size and in centimeters so you will always get the right shoe measurement whenever you are. Sole Type – If you are planning to buy tennis shoes for playing, get a pair depending on what court you are going to use it. It is advisable to have soles with small rubber studs for grasscourts for extra grip. If you will be playing in indoor carpet it is best to choose smooth soles. For general walking use, usually rubber soles are recommended to prevent slipping on most floors. Material – A few people know in order for them to be comfortable in wearing tennis shoes for hours are mostly based in the shoe material. Check if the pair is made of breathable material so even if you are wearing thick socks, you will still feel cozy not soggy. When buying your next tennis shoes, it is best to visit the shoe store during the afternoon as our feet are naturally slightly bigger during the day. This will be helpful so you can get the right shoe pair for you. When you visit the shoe shop, wear socks that you will most likely use with your next tennis shoes. If you are planning to buy online, check the specifications of the shoes you are eyeing on. If it is made for flat-flooted or for people who have high foot arches. Our feet are created different from each other so it is advisable to choose a pair that is right for your foot arch. This is to ensure comfort especially when worn for long hours. Think of all of these and you will not regret buying your new tennis shoes.